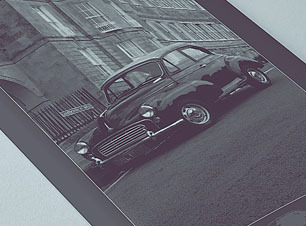 Meet A Few Of Our Customers With A Morris Minor Tale To Tell. Adrian has been a customer of ours for 21years. He feels that he is living proof that the Durable Car concept works. 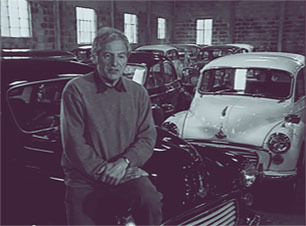 On April 1st 1998 he went to the Morris Minor Centre in Bath and met Charles Ware. Charlie sold him a Replica (converted) convertible in Trafalgar Blue. When he was just starting out driving at 17 all his friends were driving sporty minis. But Adrian didn’t want a Mini. So when his wife no longer had a company car they decided on something “cheap and cheerful" for driving around London. 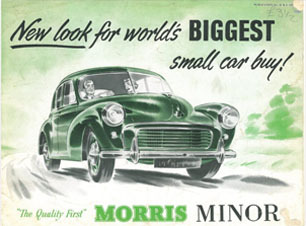 Buying a bog standard Morris from Charles Ware was their first step to getting a “hot” classic with high spec modern updates. As things came to the end of their natural life he would then upgrade that area of the car. For example adding servo and discs. 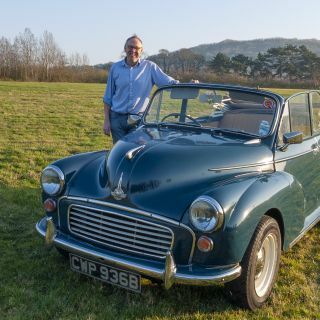 When the opportunity to buy an old wreck with a 1275cc engine and telescopic suspension came up he leapt at the chance and transferred them to his car. Then he came back to us for an Alternator conversion, remote brake reservoir top up kit and hydraulic clutch. Every few years he adds bits and pieces: Electronic ignition, Revotec electric fan, uprated heater, wider wheels, larger carb and free flow exhaust It can now output over 90HP. 12 years ago the convertible had a major MOT failure, the door shuts were moving on the rolling road. We strengthened the chassis and rebuilt it back to the rear axle. He also had the 5 speed Sierra box installed at the same time. Fascinated by the history of the car he discovered that it had always been in the Bristol area. It was originally Almond Green and the woman who owned it was a care worker and had it from 1971 until the 90’s. She was named Nelly for that time. However she got to the point where she didn’t drive it and it was let out to pasture. A local mechanic saved it and in that time it underwent a convertible conversion. Charles Ware bought it and sold it to Adrian. All in all Adrian thinks he has spent just north of £20,000 creating the Minor of his youthful imagination. Is this a lot of money? It depends how you look at it. Over 20 years that is £1000 a year. Not only has the car remained his daily driver in that time it is also more practical for modern driving conditions. When perceived from this angle it has actually been a long term investment and saving, making it an economically sound choice as well as an aesthetic one.